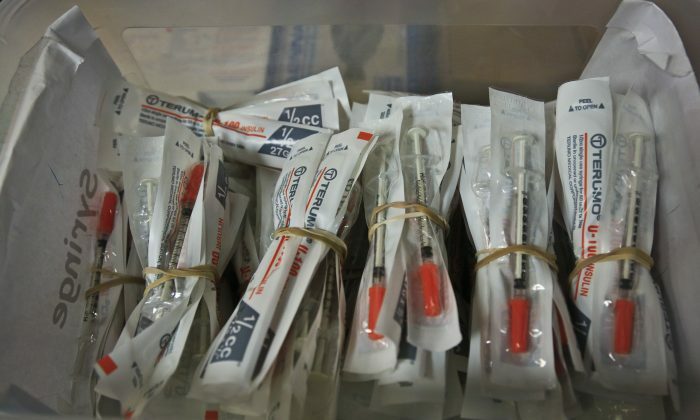 NEW YORK—The heroin and opiate epidemic will get worse before it gets better. That was the implicit consensus of the doctors and administrators at the Opiate and Heroin Crisis Roundtable at City Hall on Thursday. Opiate and heroin addiction has grown enormously in the past decade, with the number of heroin users rising from 373,000 in 2007 to 670,000 in 2012, according to the National Survey on Drug Use and Health. For many at the roundtable, it was a fact that the today’s medical institutions are not up to the task of combating the drug crisis. Hansen also stressed at the roundtable that many doctors are incentivized to turn away addicts because of the structure of drug reimbursement services and the punitive costs associated with investigating a patient’s narcotics use. The biggest challenge to the fight against opiate addiction was similar to that faced by the health care industry as a whole: lack of funds. Again and again roundtable participants referred to the resource constraints in anti-addiction programs. Seep Varma of Stay’n Out Programs shared a story of a family that took a second mortgage on their home to finance the opioid therapy for their child. Pamela Mattel, COO of Acacia Network, said that 50 percent of the methadone clinics she was familiar with were at risk of fiscal insolvency. John Coppola charged that because of cuts to anti-opiate programs in the past two to three decades, there are fewer people in treatment now than 10 years ago. Coppola is the executive director at the New York Association of Alcoholism and Substance Abuse Providers. After a dearth of funding, buprenorphine was the most popular subject at the roundtable. Buprenorphine has been gaining traction as an opiate substitute in the past few years. It was first approved for opioid addiction treatment by the European Union in 2006. The most popular form of the drug is Suboxone. “After the first seven years of Suboxone prescription, one benefit [France] saw was 80 percent reduction in opioid overdose,” said Helena Hansen, who wants access to the drug expanded. Suboxone is now the 36th most prescribed drug in the United States, up from 196th in 2006, but not everyone is enthusiastic about it. Andrew Kolodny, president of Physicians for Responsible Opioid Prescribing, pushed back on the optimism on Suboxone. The city of Chicago and two California counties are involved in lawsuits with Actavis and four other drug companies over the alleged side effects of painkillers. An alarming rise in heroin distribution with New York City at its epicenter has U.S. Sen. Charles Schumer calling for a $100 million surge of funding.